In this post we introduce the MICO showcases currently under development. All showcases will be online as a public demo by October 2016. Until then we will push out regular updates on the progress. Please contact me if you would like to learn more about the showcases or join as a showcase partner. To ensure we keep a broad perspective on the possible application fields for MICO, we have invited a number of organisations to build showcases with the MICO platform that address their particular area of interest. Our assumption is that capturing more contextual meaning in cross-media content will open the door to new products offering more natural user experiences and interactions, such as: building a holiday photo book from an archive of family photos, searching a video archive for footage where two personalities are standing next to each other, or detecting copyright infringement in media content. 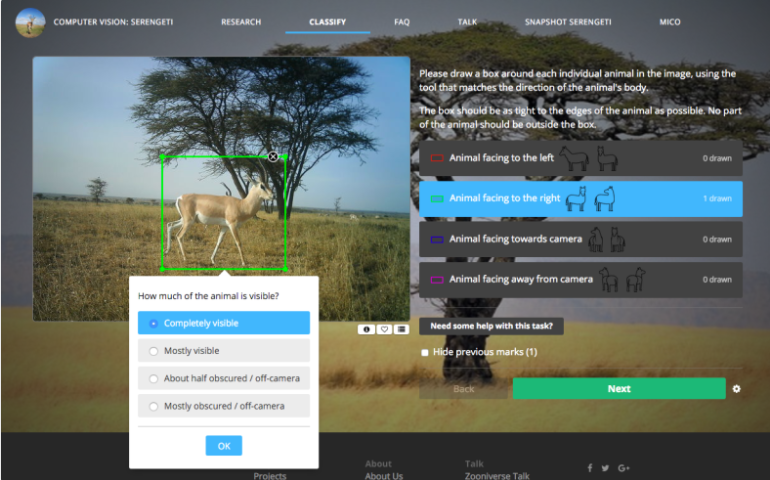 Visual and Texual Analysis for World’s Largest Citizen Science Platform – In order to test the MICO platform’s abilities at detection of species and blank images through image analysis, and at sentiment analysis and Named Entity Recognition through textual analysis of discussion posts, Zooniverse built a showcase application. 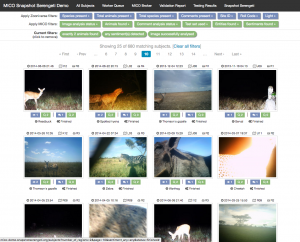 The application presents a number of tools for filtering down on certain sets of Snapshot Serengeti images. These filtered results can then be further explored by filtering according to what the MICO platform found. A specific image can be clicked to examine the MICO platform’s findings; the results are shown on two tabs – “Visual Analysis” and “Text Analysis”. People detection and browsing for social media video Platform – Shoof is a micro-video recording application for the people living in Cairo being developed by Insideout Today. The application is currently tested internally and the launch is planned for summer 2016. Insideout10 along with its sister company Insideout Today are evaluating MICO to improve review times and filtering of the content moderation work-flow that will be used by Shoof. As of today all videos being ingested from the Android application are sent to HelixWare (the Online Video Platform used by Shoof) and processed by MICO that is capable of detecting the presence of human faces, segmenting the content in sequences (for fast previews) and will eventually provide cross-media recommendations using geo querying. 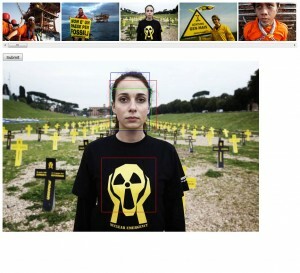 Video recommendation for Greenpeace Platform – Insideout10 has engaged with Greenpeace Italy to test the various functionalities of the MICO platform. Insideout10 and Greenpeace are experimenting MICO’s cross-media analysis and recommendations on a magazine website dedicated to the organisation’s active subscribers. In the website Greenpeace is using two WordPress plugins developed by Insideout10 (WordLift and HelixWare) that are being integrated with MICO to offer a richer user experience and a more effective cross-media recommendations. Audio manipulation detection with MICO – AudioTrust+ is about the development new and improved technologies for audio manipulation detection. A key element of the work is to combine different approaches to improve performance of detection. With its capabilities for combining extractors and query extractor annotations, MICO provides a great platform for this purpose. The plan for this showcase is therefore to integrate selected AudioTrust+ extractors, create a respective workflow for the MICO workflow, and to queries (and possibly a web front end – to be defined) to demonstrate the results. Codemill – Smart Video with MICO cross-media analysis – Smart Video is a cloud-based video software that increases online sales. It does so by increasing site traffic through metadata-supported SEO, and by increasing conversion with shoppable video. Smart Video is currently released as a closed beta and verified together with a handful of select brands and publishers, and an official launch is planned for the second half of 2016. The inclusion of MICO in the technological stack makes it easy to implement analysis pipelines, for example, for product identification and logotype recognition. The triple storage is convenient for fusing and searching heterogeneous metadata sets. With this technology underneath the hood, Smart Video turns marketing videos into online stores. Enterprise Cross Media Search with MICO – Enterprises today generate large amounts of content in different formats and structures. These include structured data in databases, spreadsheets as well as large amount of unstructured content in the forms of text documents such as emails, marketing documents written in natural language narrative and multimedia files such as images, audio recordings and video clips. All these unstructured content contain vital knowledge for the enterprise. Knowledge and information have become the most vital asset to enterprises, and it’s very important that there are mechanisms in the enterprise to extract hidden knowledge from unstructured content. It’s also vital that knowledge workers have the ability to search and retrieve relevant documents and enterprise knowledge required for their daily work. Multimedia archive search with MICO – The client has a large archive of multimedia content that offers limited information retrieval functionality. With MICO the plan is to apply image similarity analysis and video annotation to provide more relevant and efficient information retrieval. This is only an initial draft, more details to follow soon. The showcase will be provided by Redlink GmbH.